Our first taste of late autumn chill will soon visit as renovation to ballfields hits a fevered pitch. The race is on to get field projects done before the colder winter weather sets in across much of the United States. In the northern parts of the country, we have just a couple more months before old man winter’s icy winds will begin to shut things down. But down south, there is still ample time to do important renovation work to your fields provided there is a break in the scheduled use of your facility. With the renovations we have covered in our previous posts — Renovation PART 1 and PART 2 — your turf and infield skin should be in fine shape by now. In this post, we’ll wrap up post-season renovation by paying close attention to the two areas on the ball field that see the bulk of the abusive wear all summer — the mound and home plate areas. What started as a great pitching mound in the spring, with its well defined table and perfectly sculpted front slope, sometimes better resemble a pimple by the end. 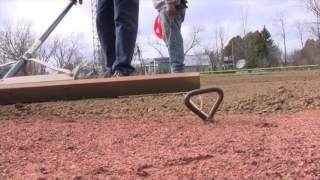 To start the mound renovation process, you should begin with determining whether the pitching rubber needs to be replaced or turned (If it is a block pitching rubber). If the rubber needs replacing or turning, reference the directions under “Setting The Pitching Rubber” in Beacon’s Online Field Dimensions & Reference Guide (order a hard copy today from our webstore) to ensure proper placement and alignment of the new or turned pitching rubber. Next, setup a mound slope gauge on the front of the mound to measure existing conditions. Cut and shave any high areas while marking to indicate low areas. Add clay where needed, roll and tamp firmly. Replace the gauge on the front slope of the mound and continue to make adjustments as needed until the slope across the face of the mound is perfect. Finish by rolling the front slope smooth. The sides and back of the mound should have a consistent slope that runs from the clay area edges on the mound to the grass edge at the base of the mound. Before winter sets in, strip all loose topdressing and soils from the home plate area. Aggressively nail drag the home plate area to scarify the high spots down. Use a level board or rake to pull the excess material in the high spots away and into the low areas. Continue to work the surface until the high spots appears level. Check your work by stretching a string line from the surface of the home plate to the grass edge of the home plate circle. Make sure the string is very tight to avoid improper readings. Where the surface pushes the string up, it is likely still high. Use a sharpened iron rake or X-drag to make further cuts to lower the high spots then pull the excess to low areas. Bring in additional material as needed to finish the leveling. When finished roll the soil tight. If your field is in a northern climate where snow covers the ground during the majority of the winter, then there is nothing to worry about. Perhaps you have other ideas on how to capture the topdressing before it plants itself in your turf edges. If you do, send me your pictures and ideas (paulz@beaconathletics.com) and we’ll share them with our readers here at the Ballfields Blog.